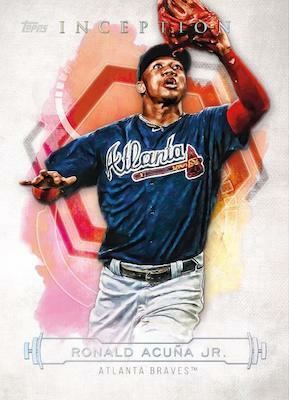 Featuring many of the budding MLB stars, 2019 Topps Inception Baseball works with a "less is more" mindset. In this case, the format sticks with the seven-card boxes of past years. Of course, each box has one autograph or autograph relic. Those buying cases can expect four autograph relics, one autograph jumbo patch, and one Silver Signings card per case. 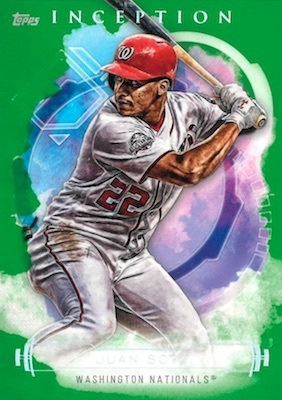 The first thing many collectors will notice with 2019 Topps Inception Baseball is the design. Seemingly switching back and forth each year, 2017 had a lighter color scheme while 2018 went a bit darker. For 2019, we head back to the light. Inside the 100-card base set is a roster of rising talent. The players can also be found in several parallels, including Green, Purple (#/150), Magenta (#/99), Red (#/75), Orange (#/50), Blue (#/25), Inception (1/1), and the one-of-one Printing Plates. Parallels combine to average two per box. 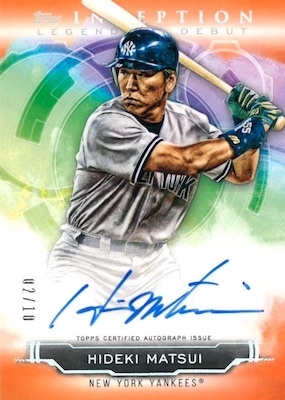 The 2019 Topps Inception Baseball checklist also promises many on-card signatures. The numbered Base Rookies & Emerging Stars Autographs subset uses the base design as a canvas for hard-signed content. Parallels include Magenta (#/99), Red (#/75), Orange (#/50), Blue (#/25) and Inception (1/1). Focusing on the league standouts, the Short Print Inceptions Autographs lineup is limited to just 10 copies apiece. More stars enter the mix in Inception Legendary Debut Autographs (#/20). These hard-signed cards showcase the veteran players during their MLB debuts. There are also Orange (#/10), Blue (#/5) and Inception (1/1) parallels. Contrasting with the lighter designs, the case-hit Inceptions Silver Signings cards use a black scheme and silver ink to really pop. These come as Gold (#/25) and Gold Inscription (1/1) versions, as well. Giving even more attention to the up-and-coming names are the numbered auto relic inserts. 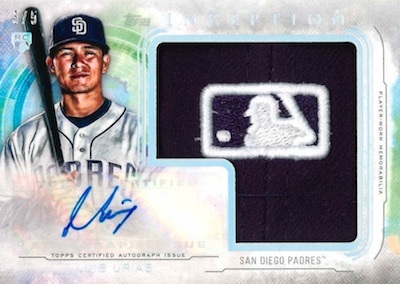 Averaging 1:4 boxes, the Inception Autograph Patch cards offer top 2018 rookies and other young subjects, while the one-per-case Inception Autograph Jumbo Patch cards look to the 2019 rookies and additional notable players. The standard patch set has numbered Magenta, Red (#/25), Orange (#/10), Blue Button (#/6) and Inception Majestic Logo (1/1) parallels, and the jumbo edition adds Orange (#/10), Blue (#/5) and Inception (1/1) parallels. There are also the all-new Inception Autograph Jumbo Hat Patch cards that display player-worn MLB Silhouetted Batter Logo (#/5), New Era Logo (#/5), or Team Logo (#/5) patches. 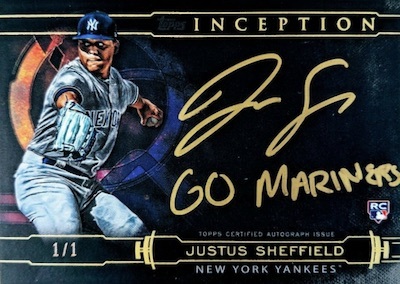 Very rare booklet cards finish off 2019 Topps Inception Baseball with several choices. This includes on-card Inception Autographed Team Logo Patch Book (#/2), Inception Autographed Letter Book (#/2), Inception Autographed Laundry Tag Book (1/1), and Inception Autograph MLB Silhouetted Batter Logo Patch Book (1/1) cards. 2018 Topps Inception Victor Robles Rookie Autograph! 1 1 On Card Auto! NL ROY! Buy MLB Hobby boxes direct from Topps. PARALLEL CARDS: Green, Purple #/150, Magenta #/99, Red #/75, Orange #/50, Blue #/25, Inception 1/1, Printing Plates 1/1. PARALLEL CARDS: Magenta #/99, Red #/75, Orange #/50, Blue #/25, Inception 1/1. 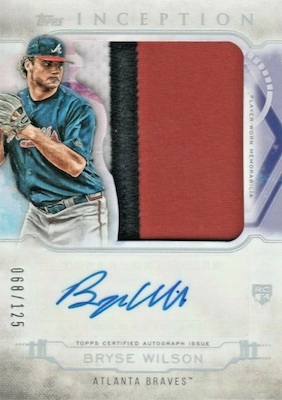 Buy 2019 Inception MLB autographs on eBay. PARALLEL CARDS: Orange #/10, Blue #/5, Inception 1/1. 36 cards. Serial numbered. 1 per case. PARALLEL CARDS: Gold Ink #/25, Gold Ink Inscription 1/1. 51 cards. Serial numbered. 4 per case. PARALLEL CARDS: Magenta #/75, Red #/25, Orange #/10, Blue Button #/6, Inception Majestic Logo 1/1. 29 cards. Serial numbered. 1 per case. PARALLEL CARDS: Orange #/25, Blue #/10, Inception 1/1. VERSIONS: MLB Logo #/5, New Era Logo #/5, Team Logo #/5. 17 cards. Serial numbered #/2. 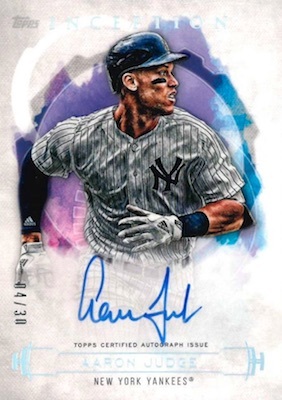 View the 2019 Topps Inception Baseball checklist Excel spreadsheet. Topps is stepping up its game now. They had been resting on their laurels (Yannys?) a little since getting the MLB logo contract, but Panini was making them pay with better design. Now, this is a clear move in the right direction with more style, color and quality. I’m excited for this release and love the pre-release card pics. Can’t figure it out. Diamondbacks have been a contender in the West for awhile now and NO BASE CARDS. Only two card’s in the whole set (Inception Legendary Debut Autographs Set) Justin Upton and Mitch Haniger. What gives Topps ? Some of the pictures imply sticker autos. Enough. On card autos only, please. I think collectors should reject these ‘fake’ autos and Topps will change. Probably a tough ask. The checklist is odd. One dodger auto Dennis Santana unless I’m missing something. Other teams got screwed too. Just strange. Red Sox win the World Series and get a total of 4- yes 4 cards!?! Two base and two Devers Auto. I guess that’s what you get when you win the World Series and your not the Yankees! Are all of the relics “player worn” pieces? I haven’t seen any that are game worn. I’ve only seen player-worn cards so far. The cases do not have variety on the hits, usually pull 2 or more of the same player in the same case. Way too expensive for the quality of cards and lack of hits. Clearly just a “filler product” from TOPPS. I hope the dealers complain back to the source. Been watching case break after case break. Some good cases of course, but overall, at $70 a box, this is not a good value. This should be 30-40 a box for the 7 cards and the $10 (maybe) auto you will pull. Really tough checklist this year. Cards are beautiful, but checklist……OUCH! Cards are beautiful to see but the odds of hitting an autograph that you would actually want are way beyond hard. With the weak auto list or auto dump, price should be about $30.00 instead of the $70.00 that our locals are charging. Buy at your own risk but more than likely you will pull an auto of some guy that only his momma would know. I like the feel of the cards. The price seems a bit steep when the checklist is so long. Also, as some have said, TOO MANY YANKEES. Who cares about Matsui? He was barely average as a player and no one really needs more of his cards. Why not some other teams? I know there isn’t a ton of value in the boxes themselves, but the cards look amazing, and I enjoy the way they feel. I know some have complained about the checklist, but I’ve been hooked about collecting Braves in this product, especially guys without a lot of other autos in products (Camargo). Great if you want patch autos of some lower tier prospects. Otherwise, its just a bunch of base cards. Bought a case, Luckily I got it really early and paid $820. I pulled 2 good cards out of the 16 boxes. Rizzo /10 and Tucker /25, other than that it was pretty bad. Got around $500 worth of value, it would of really hurt If I paid the release prices of $1,190. I gave this product an extra star only because the appearance is very nice.